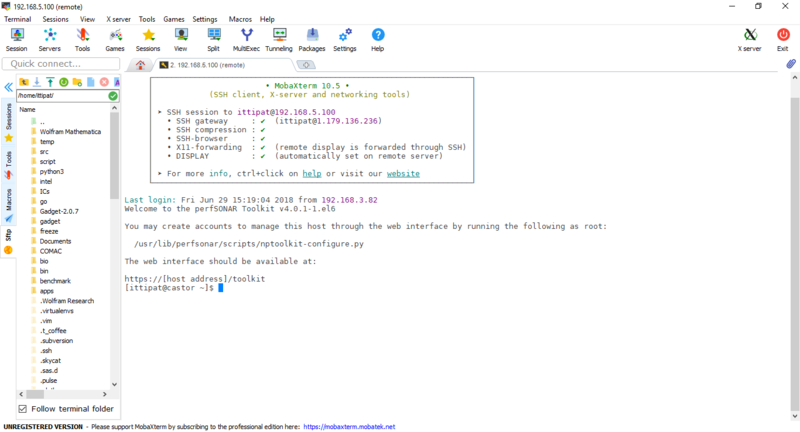 Here we describe the process to connect to the remote server from Microsoft Windows with MobaXterm. 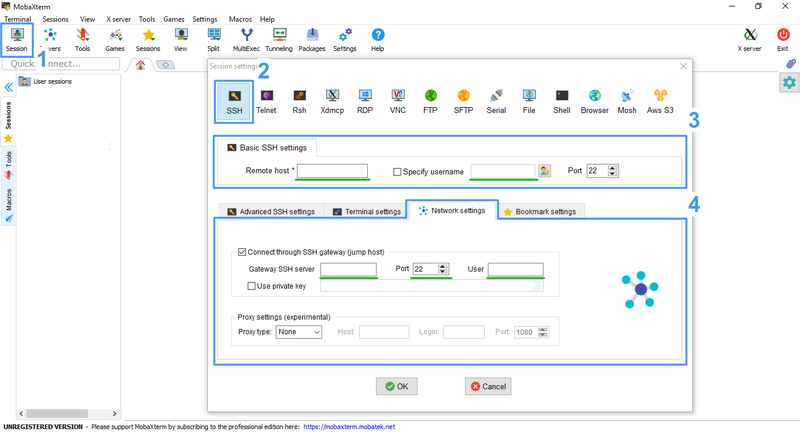 MobaXterm is a toolbox for remote computing for Windows. It provides important packages: remote networking tools, Unix commands, sftp for transferring files, XRDP, etc. First, download the program from the MobaXterm website. There are two versions provided, portable version and installer version. Portable is simple, you can use it immediately after extract (unzip) the package. Because the required libraries for the program are included in the package. Installer version requires to setup through the installation process. So, choose whatever you prefer to. After the program has installed/extracted successfully, open the program, and click the top-left icon Session. The small window will appear, then select SSH tab. If you are connecting directly to the NARIT network, just fill in the IP address and username (3), and press OK (leave the port number to be default). If you are using the internet outside, click on tab network settings (4) and then fill in the gateway IP address, port, and username. You can start working and submitting a job by using the command line interface. The left panel shows your files and folders at the home directory. You can simply drag and drop files from your local machine to upload to the server or download some files from a folder to your computer. If Follow terminal folder is checked, this panel will follow you wherever you change directory to.